At this site, you will find information regarding online poker – a much loved hobby that’s been growing in popularity each year since the late 1990s. 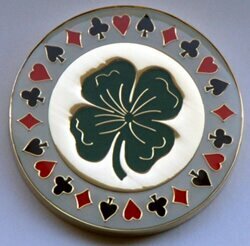 Poker is a game of skill but it does not hurt to be lucky as well! Poker is considered a North American game, although it can trace its roots back to similar card games played in Europe and Asia. There are many different types of poker and their popularity vary, both over time and depending on geographical location. Examples of well known poker variants are Texas Hold’em, Omaha High, Omaha Hi-Lo, 5 Card Stud, 7 Card Stud, 5 Card Draw, Badugi, Pai Gow and Razz. One of the earliest mentionings of poker can be found in Jonathan H. Greens book “An Exposure of the Arts and Miseries of Gambling” from 1843. In this book, we learn how the game of poker is spread throughout the United States by the Mississippi riverboats. The Mississippi River is the largest river system in North America and the river flows through the states of Minnesota, Wisconsin, Iowa, Illinois, Missouri, Kentucky, Tennessee, Arkansas, Louisiana and, of course, Mississippi. People traveling on the steam boats needed a way to keep themselves entertained and poker became a favored pastime. With the advent of internet, poker enthusiasts took the game online. As early as the 1990s, poker was played online in the form of IRC poker. IRC poker was played over the IRC chat protocol and a computer program was used to deal the cards. In the first versions you had to type you commands, but point-and-click graphical clients were soon developed; precursors to the modern poker clients of today. IRC poker was not played with real money but still attracted a fairly large number of players, including a young Chris Ferguson who would eventually go on to win the 2000 World Series of Poker (WSOP) Main Event in Las Vegas and receive a $1.5 million prize. Planet Poker became the first poker site to offer real money games, dealing their very first real money hand on January 1st, 1998. The first game was $3/$6 Texas Hold’em. By the early summer, Planet Poker had accumulated enough customers to regularly have games running around the clock. Back then, nearly all poker players online had dial-up internet access and the internet itself was still in its infancy. Today, there is a long row of poker sites to chose among online. There’s poker portals covering WSOP and other poker tournaments like the Swedish authority site on poker, pokerspelaren.se. The one with the most cash table traffic is PokerStars, while on second place in terms of cash table traffic we find not a particular poker site but a poker network named iPoker. A poker network offers software to poker sites (often known as “skins”) and pool all the players together within the network. A player signed-up with Site A can therefore be seated at a table featuring players from Site B, Site C, and so on. Examples of poker sites that are a part of the iPoker Network are Titan Poker, Bet 365 Poker, William Hill Poker, Expekt Poker, Paddy Power Poker, Winner Poker, Sun Poker and Poker770.